Joy Davis was the eldest son of James and Margaret Davis. Joy was born in Belfast about 1884. Joy Davis attended Drumglass National School. He had served on the Army for a number of years, but his period of service had expired. Sergeant-Major Davis promptly rejoined on the commencement of the war with the Army Service Corps. 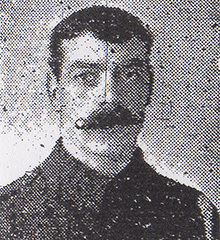 He was married to Cicely with two children and lived in Belfast. 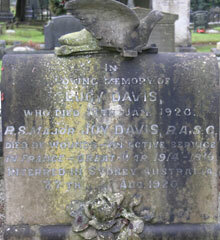 On his gravestone, it states Sergeant-Major Joy Davis died of wounds received on active service in France. He was interred in Sydney Australia on 27 August 1920. The CWGC details of Sergeant-Major Joy Davis cannot be located. The Sydney Memorial stands in Sydney War Cemetery, which is situated about 17 kilometres west of Sydney. By road the route is along the Great Western Highway (Parramatta Road), turning south into Marlborough Road which continues direct to the cemetery. The War Cemetery itself is in the grounds of Rookwood Necropolis, and the main entrance is at the western side, on the necropolis roadway.